B.C. 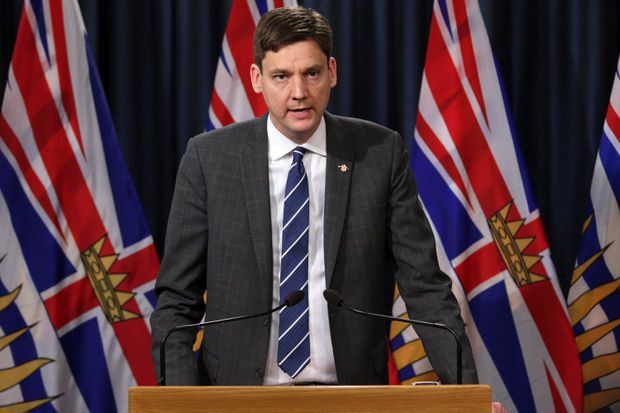 Attorney-General David Eby speaks during a news conference at the Legislature in Victoria. British Columbians who participate in an electoral-reform referendum this fall would first be asked whether they want to switch to proportional representation, and then to rank three specific PR systems, the province’s Attorney-General said Wednesday. David Eby said the referendum would be conducted by mail-in ballot, with the campaign to begin July 1 and a voting period to run from Oct. 22 to Nov. 30. But opponents were quick to criticize the vote as overly complicated and to seize on what remains unknown, including what the district boundaries would look like under PR. Mr. Eby’s recommendations still must be approved by cabinet, but he said starting the campaign in less than four weeks can be done. The announcement of a proposed ballot question sets off a process that could dramatically reshape the political system in a province that has already voted twice on proportional representation, in 2005 and 2009 – votes that involved the single transferable vote system and failed to meet the threshold to succeed. Mr. Eby told reporters if a majority voted to switch to PR on the first question, the second question would determine which system is used. The three types of proportional representation that would be on the ballot include mixed-member proportional, which is used in a handful of countries, mostly in Europe, and two Canadian-designed systems that are not in use anywhere, known as dual-member proportional and rural-urban PR. If voters decided to adopt a proportional representation system, a second referendum would be held after two general elections, so voters would have the opportunity to return to first-past-the-post, Mr. Eby said. Bill Tieleman, who helped lead the fight against proportional representation in the previous referendums and will do so again, said the vote shouldn’t even be occurring, since 61 per cent of voters supported first-past-the-post in the last referendum. He said the plan outlined by Mr. Eby is complicated and none of the three PR systems would come with riding boundaries. “The government can’t tell one person, one voter in B.C., exactly which riding they’ll be in, or how many members there will be in that riding, or how many citizens will be in that riding,” he said. Andrew Wilkinson, Leader of the BC Liberals, said the NDP government wants voters to support a system that would ensure one-party majority governments become rare, if not extinct. “You can choose the NDP’s alphabet soup, their stacked deck and their rigged game they set up to please the Green Party, or you can choose what we’ve had for 150 years and has worked really well as a solid parliamentary democracy,” he said. Sonia Furstenau of the BC Greens, which are supporting the New Democrats in the minority legislature and campaigned on a platform that called for proportional representation, said the Liberals have benefited from the current system and Mr. Eby struck the right balance. Maxwell Cameron, a political science professor at the University of British Columbia, said in an interview that he was pleased with the questions, the plan for a subsequent referendum and a 5-per-cent threshold to guard against extremist parties. But he said some issues remain unresolved, including the timeframe. “We’re going to need Elections BC to come up with some educational material for us pretty quickly that sort of outlines in a little bit more detail what exactly these alternatives look like,” he said. Hamish Telford, an associate professor of political science at University of the Fraser Valley, said he was relieved the Attorney-General offered a clear approach with specific alternatives, but he also raised concerns about public education. Here’s a look at the three options British Columbia voters will choose from when they go to the polls this fall to vote in a referendum on changing their electoral system. Where it’s used: The report notes the system was developed specifically in Canada, but it isn’t in use. It was among the options Prince Edward Islanders had to choose from in that province’s electoral referendum in 2016. It received the third most votes. Voter turnout in the online plebiscite was 36.5 per cent. How it works: This system combines elements of first-past-the-post with list-based proportional representation. Electoral districts would be larger than current ridings and each would elect MLAs using FPTP, as they do now. Additional MLAs selected from party lists would then be appointed to larger regions to make the legislature reflect the overall provincial results. The report says MLAs selected from party lists should make up no more than 40 per cent of the seats in the legislature, though how those lists are determined would be worked out later. Where it’s used: Variations of it are used in New Zealand, Germany, Scotland and Wales. It was the method chosen by a citizens’ assembly in Ontario, but only 37 per cent of Ontarians voted in favour of the change in a referendum in 2007. How it works: This system was also developed specifically for Canada. It would elect MLAs in two ways: by using mixed member proportional as described above in rural ridings and by using a different system, the single transferable vote, in urban and semi-urban areas. The STV model requires the ranking of candidates in the voter’s order of preference. Where it’s used: It is not in use. An STV system was recommended to British Columbia voters in referendums in 2005 and 2009, but the votes did not pass.